Nikon's D7000 digital SLR camera aimed at advanced amateurs boasts many features normally found on in their professional line-up, such as a weather sealed magnesium and polycarbonate body, a 16.2 megapixel CMOS sensor, 39 AF points and continuous shooting at 6 frames per second. Nikon D7000: Click on the thumbnail for the larger image. Gary Wolstenholme takes a close look at Nikon's new D7000 camera, which boasts specifications that appear to blur the line between high end consumer and professional cameras. In 2004, Nikon's D70 camera caused quite a stir, offering some features and resolution seemingly reserved for contemporary professional and semi-pro bodies such as the D1x and the D100, but at a cut down, bargain basement price. At the time the specification and overall performance was so good for the price, it pretty much made the D100 redundant as it offered little extra for its higher price point. Over time Nikon have made this a bit of a habit. When the D300 camera was announced in 2007, it pretty much made the older D2x redundant, except for those who had the need for hammering nails with their camera. In their continued effort to blur divisions between different levels of camera within their range, Nikon have now released the D7000, which sits at the top of their consumer SLR range. Although it bears all the hallmarks of a high-end consumer level SLR, such as a compact, lightweight body and automatic scene modes, it borrows quite a lot from higher up the range too, giving enthusiasts a very well featured camera for slightly less money. For example, this camera currently retails for £1095 as a body only kit. Nikon's current entry level professional model currently only costs £25 more. So where's the logic in this? Surely seeing the minute price difference, most photographers will purchase the D300s to take advantage of its weather sealing, rugged build and high frame rate? The proof of the pudding is in the eating, as they say, so Gary Wolstenholme will have his fill and let you know what he thinks in this in-depth review. Nikon have added/changed/tweaked so many features on the D7000 compared to other models in their current line up that it is difficult to know where to start! A new 16.2 megapixel CMOS sensor takes care of recording images and has a native sensitivity range of ISO100-6400, plus expansion up to ISO25600, which should provide plenty of scope for creativity and for shooting in very low lighting conditions. It's quite interesting to see that there is an extra stop of native sensitivity at either end when compared to the D300s and D90 cameras, despite the pixel count being increased. Normally higher pixel densities result in more noise at high sensitivities and we'll take a closer look at this aspect of the cameras performance later in the review. Storage of these images is taken care of by two SD compliant card slots, which support the new SDXC format as well as the familiar SD and SDHC standards. Having two card slots like this is a first for consumer level SLRs, and just like on their professional flagship models, each slot can be configured to either back up photos off the other card, or function as extra storage once the first card has been filled. Each card slot can also be assigned a different function, for example you can record still images to one card and videos to another. This feature is very much a welcome addition in my opinion, which most users should benefit from. The D7000 is amongst the first of Nikon's DSLRs to receive the new Expeed 2 image processing engine, which promises to improve image quality, speed, responsiveness and video recording quality, all while consuming less power. This new processor was first seen in Nikon's entry-level D3100 and I'm sure we will be seeing it rolled out across the Nikon range as their cameras are updated. Nikon's D7000 is sealed against dust and moisture. Extra ruggedness is also added in the form of magnesium top and rear panels. A reliable shutter system tested to 150,000 cycles has also been fitted, which is the same specification as Nikon DX professional flagship, the D300s. Flash sync is set at the Nikon standard of 1/250sec and the fastest shutter speed available is 1/8000sec, which should provide plenty of scope for creative flash work and for shooting action which requires very fast shutter speeds. The maximum continuous shooting speed of six frames per second will also come in handy when shooting action. 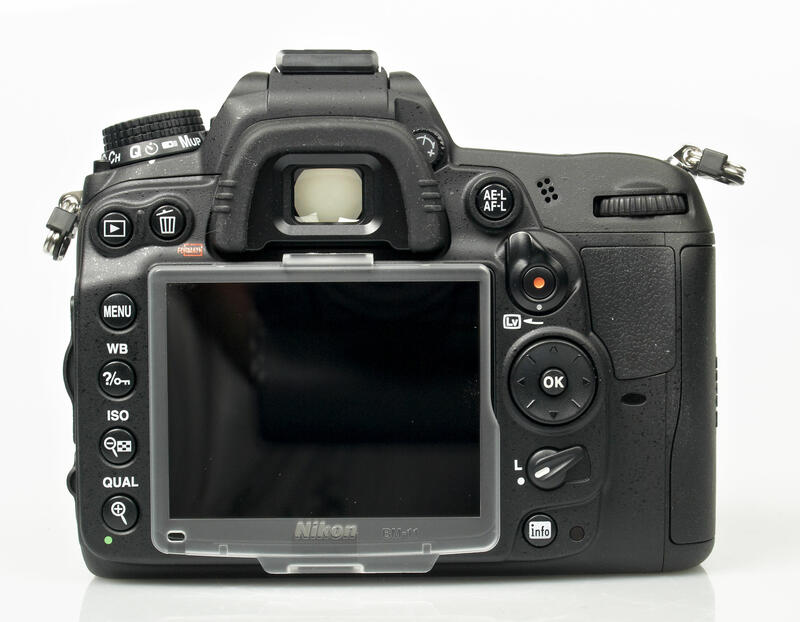 Continuing the theme of increased durability, the 920,000 dot LCD colour screen is protected by a reinforced glass cover, as well as the standard plastic clip on screen protector found on most Nikon DSLRs. A completely new 39 point autofocus system has been implemented, giving more scope for tracking moving subjects, or for creative composition than the standard 11 point focusing systems found on Nikon's other consumer DSLRs. The new Multi-CAM 4800DX sensor sports a similar configuration to that found on Nikon's professional models, with 9 cross type sensors located around the centre of the frame and a variety of customisable dynamic focus tracking options available. The AF points are configured to cover a wide area of the frame and the performance seems every bit as good as the D700 and D300 bodies I had available for comparison, when used with the same lens. Low light focusing performance is also good, with the AF sensor having a detection range down to -1EV. A new 2,016 pixel RGB sensor takes care of exposure metering. 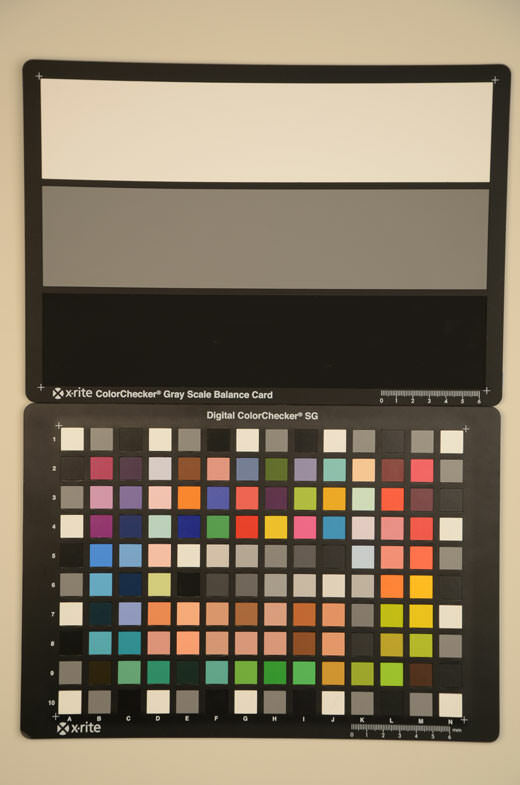 Being sensitive to colour as well as luminance, the theory is that the meter should be more difficult to fool by brightly coloured subjects under normal shooting conditions. The resolution of the metering sensor is more than twice that of the D300s, and more than four times that found on the D90, which should lead to more accurate exposures in difficult and high contrast lighting conditions as a finer sensor should be more able to distinguish areas of high contrast. 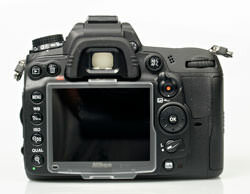 A built-in flash is provided, which has a guide number of 12m (ISO100/m). This should be adequate for a little fill-in flash here and there, but also serves as a commander for triggering compatible Nikon Speedlites via their Creative Lighting System. 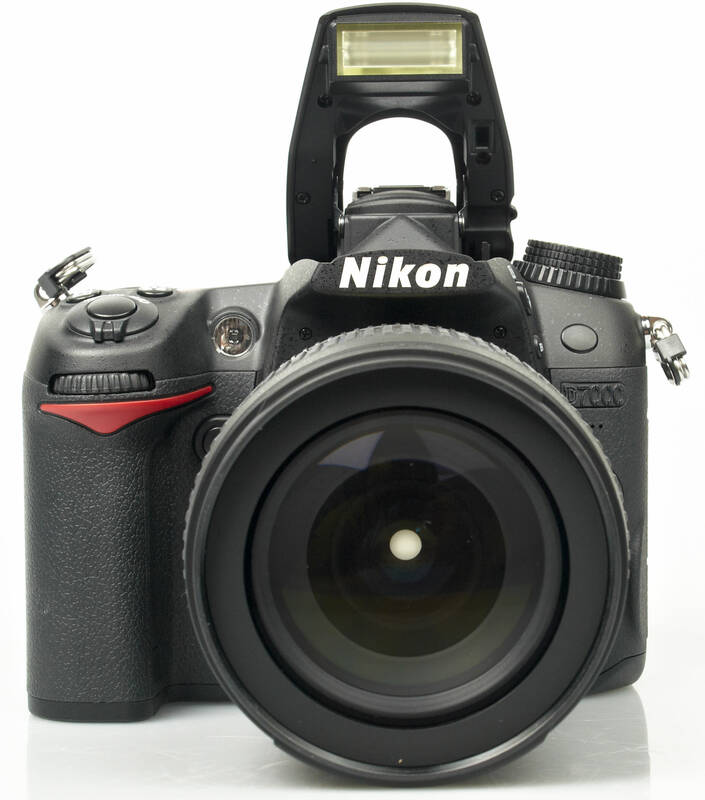 Nikon D7000 Key features: Click on the thumbnails for larger images. Although the camera looks familiar, controls for live view and AF mode selection have been redesigned. 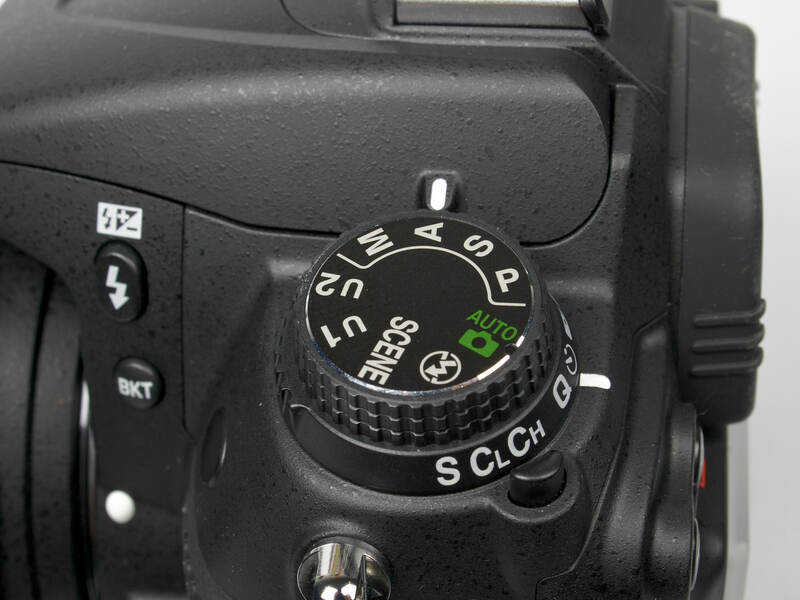 A new exposure mode dial gives priority to creative exposure modes and a drive mode dial nestles underneath. 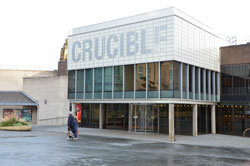 Magnesuim has been used to construct the top and rear but the front is constructed from polycarbonate. A new EN-EL15 battery pack promises extended shooting, but isn't backwards compatible with the common EN-EL3e battery pack. HD Movie recording has become a pretty standard feature on DSLRs released over the past couple of years. The D7000 is no exception and capable of recording 1080p videos at a frame rate of 24 frames per second for a maximum of approximately 20 minutes. Power is provided by a new 19000mAh EN-EL15 battery pack. 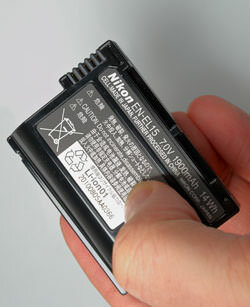 Although this battery promises to hold more charge and last longer than the EN-EL3e pack found on other current Nikon models, the fact this battery is not backwards compatible may upset Nikon users wishing to upgrade to this new model. As with any new battery, the street price can be a little steep with some retailers selling them for around £70. Nikon's MB-D11 battery grip is a new addition to their range, and offers a vertical shutter release and an extra multi-directional controller to improve handling when shooting images in portrait orientation. This grip costs around £350 and is of a similar style to the MB-D10 for use with Nikon D300, D300s and D700 cameras, but unfortunately the grips aren't inter-compatible due the the different camera body designs. In terms of build quality and design, Nikon's D7000 is kind of a halfway house compromise between the ruggedness of their professional models and the lightweight compact designs of their high-end consumer SLRs such as the D90. Rugged, yet lightweight magnesium has been used for the top and rear parts of the camera, whilst reinforced polycarbonate has been used for the front grip section. Overall, I feel this design strikes a good compromise between durability and lighter weight. Not everyone wishes to lug around nearly a kilo of magnesium, when the most action it will see is the odd spot of rain here or there. That issue is taken care of by the sealing applied to the joints and doors for memory cards and the battery, which should keep the odd splash of water from getting where it shouldn't. In fact, despite the extra attention applied to the build, the D7000 only weighs 70g more than the D90. Nikon appear to have worked hard at getting the handling right with the D7000 and although the size and shape is very similar to the D90, the controls have been redesigned substantially in some areas resulting in a more pleasant, direct user experience. For example AF mode selection is now taken care of by a button placed inside the switch for changing between auto and manual focus modes. Also the Live View control has been redesigned. A rotating switch has replaced the button found on the D90 and D300s cameras, which should please left-eye dominant shooters who may have experienced issues with activating Live View with their nose when using the viewfinder. Speaking of the viewfinder, it is bright, clear and fills my field of vision well. As a glasses wearer I had no issues using the viewfinder with my specs on. Other aspects of the design to receive a makeover include the multi directional controller and the exposure mode dial. The directional controller on the rear has very little travel, unlike the rather spongy feeling controls found on some other Nikon cameras. This is ideal when faced with 39 focusing points. The exposure mode dial has priority given to the four creative M, A, S and P exposure modes, moving scene mode selection to a menu on screen. For those times where you need a bit of automation to take over, the green auto and auto with flash disabled modes are still selectable from the dial. Located on a bezel underneath this dial are the camera's drive mode options. I prefer this method over the one found on the D90 as it's easier to select what you want, and to see what you've selected. A lock button is located to the left of the control to prevent it being changed by accident. The last thing you'd need when shooting action would be to find the camera has slipped onto the quiet release mode. Luckily there is little or no risk of this ever happening. Overall I really enjoyed using the D7000. I feel the revised control layout and build has produced a camera that is easy to use, not to heavy to carry around and rugged where it needs to be. Nikon's 2016 RGB pixel metering system copes well in a wide range of conditions, producing balanced exposures under even lighting conditions and coping with moderate back lighting rather well too. Unfortunately a side effect of this is that the camera tends to expose for the shadows in matrix metering mode, which can lead to washed out skies in landscapes with high amounts of contrast. Still, if you are aware of this quirk the appropriate amount of compensation can be applied. Centre-weighted and spot metering modes are also available. One thing I have always like about Nikon's spot metering is the way the metered area follows the AF point selected, allowing you to meter off what you're focusing on, without having to much around locking the exposure and recomposing. 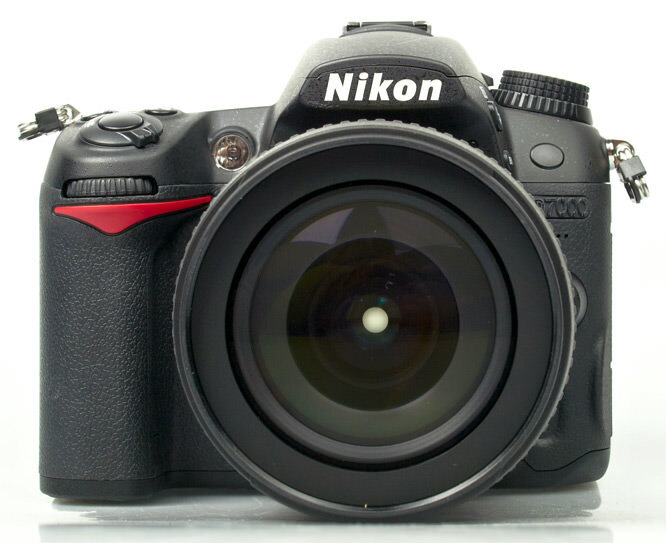 Nikon D7000: Click on the thumbnails for larger images. The exposure system tends to favour exposing for the shadows in high contrast scenes. 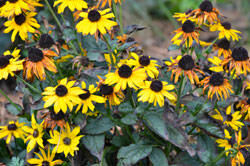 The bright yellow of these flowers has been rendered well, with few blown highlights. Evenly lit scenes are exposed very accurately. Colours are vibrant with excellent contrast. Nikon's active Dlighting feature has been present on their DSLRs for a long while now. 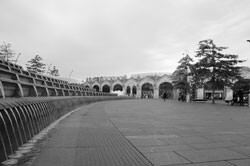 The feature aims to increase the dynamic range in photos taken in high contrast conditions. It does this by holding back the highlights and brightening the shadows, whilst ensuring that localised contrast is maintained. Active Dlighting differs to the Dlighting feature which can be applied to images afterwards because it works on the RAW data before saving the image to JPEG, whereas the standard Dlighting has only the information in the final JPEG to work with. 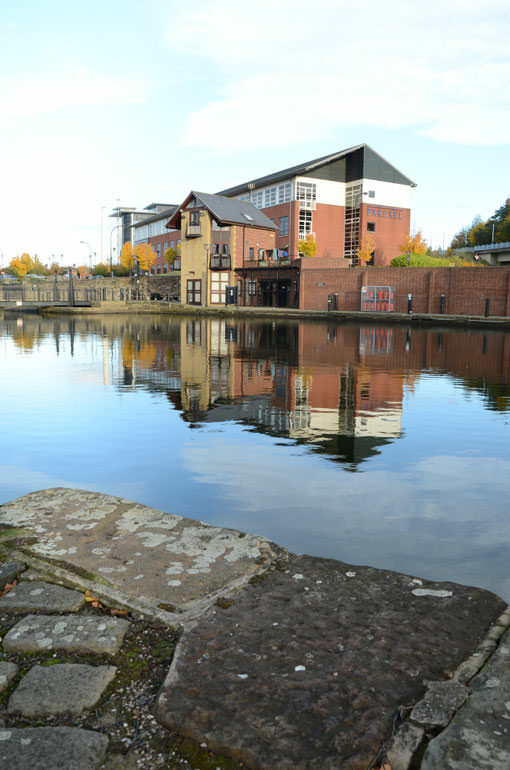 Settings include an automatic mode, which will assess the contrast in the scene and apply to appropriate level of correction and five manual level ranging from 'Off' to 'Extra High'. As can be seen in the images below, this feature works well, producing images with a subtle HDR look to them due to the darkened highlights and brightened shadows. Active Dlighting Off. Active Dlighting Low. Active Dlighting Normal. Active Dlighting High. The brand new 39 point AF array on the D7000 has focus points laid out across a wide area of the viewfinder, and arranged in a similar way to the 51 point AF systems found on Nikon's professional level SLRs. The nine points arranged near the centre of the viewfinder are all cross-type sensors, sensitive to horizontal and vertical contrast. As with the 51 AF point systems, this new 39 point system has a huge array of customisable focusing options at your disposal. Almost every conceivable option you could imagine from auto area AF, where the camera decides on the focusing point, right through to selecting one point at a time manually is covered through the custom settings menu. Focus points can be grouped dynamically, to help subject tracking, or even disabled. If 39 points is just too much for you to get to grips with, an option to only enable 11 points, arranged in the same way as found on the D90 can be selected. Using the 18-105mm lens supplied with the camera for review, focusing is reasonably quick, but not blistering by any means. After trying the camera out with a few other lenses, such as the 70-200mm f/2.8 VR Mk1 it became apparent that it wasn't the camera slowing down the focus action. Using the same lens, focusing is every bit as quick and accurate on this camera as the D300 and D700 I had available for comparison. Focusing during live view can by performed either by contrast detection using the imaging sensor, or by dropping the mirror and using the camera's normal focusing system. Many will prefer to use the contrast detection system, as it doesn't result in the screen blacking out each time you wish to focus as the other method does. The contrast detection focusing performs reasonably well, but is noticeably slower than focusing through the viewfinder, which may pose issues with erratic or faster moving subjects. Focus can also be performed during video recording, although the system relies on hunting back and forth to achieve focus, which can look quite unpleasant. Not only that but every last bit of noise created by the focus motor is recorded in the footage and even AF-S lenses create a disturbing level of audible noise. The new 16.2 megapixel CMOS sensor is certainly more than capable of producing sharp and detailed images, with excellent clarity straight from the camera. Nikon D7000 JPEG v RAW: Click on the thumbnails for larger images. JPEG sharpness test image. 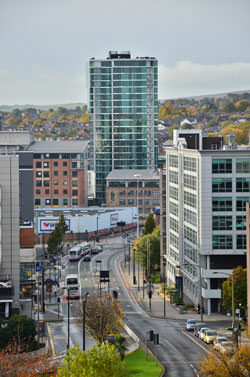 The same image processed from RAW using Nikon View NX2. 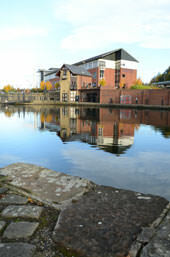 The image above was taken with Fine JPEG and RAW quality settings simultaneously using a Nikon 50mm f/1.4D lens set to f/11. 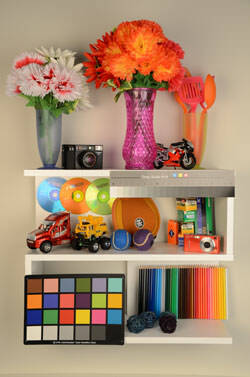 The new Expeed 2 processor produces JPEGs straight from the camera with an excellent level of detail. They are virtually indistinguishable from the RAW files in terms of detail and sharpness. 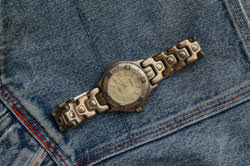 Every last nick and scratch on the watch has been rendered clearly in both images. Even though Nikon have managed to squeeze another 4 million pixels into their DX format CMOS sensor, the performance at high ISOs doesn't appear to have suffered at all. Images taken between ISO100 and ISO800 show no significant signs of noise and fine details are still rendered clearly. Upping the ISO to 1600, results in a slight amount of noise being visible in shadow areas of the image and a slight softening of fine details due to noise reduction, still the performance here is still acceptable, even for large prints. ISO3200 is much the same, it a tiny bit softer around areas of fine detail and a little noisier in shadow areas. Still the performance is very good for such a high sensitivity on a DX format sensor. Even ISO6400 isn't bad by any stretch of the imagination. Noise is more noticeable across the image, and fine details such as the brickwork on the building across the canal are visibly softened. Even so I still believe a decent A4 print is possible at this sensitivity, which is excellent performance for a DX sensor camera. One thing I noticed is that even at ISO6400, the exposure latitude is still pretty good. 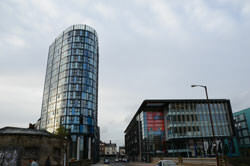 Normally high ISOs result in a marked reduction in dynamic range but the D7000 appears to perform well in this area. Once the camera is pushed into its extended ISO range, the levels of noise become much more apparent across the image and fine details suffer as a result. Hi1 (ISO12800) should still be fine for sharing at lower resolutions on the web, and Hi2 (ISO25600) for when you're left with no other option. Nikon D7000 Outdoor ISO speed test: Click on the thumbnails for larger images. Nikon D7000 Test chart ISO speed test: Click on the thumbnails for larger images. With the standard picture control setting selected, the D7000 produces images with vibrant, yet natural looking colours with decent contrast. Five other preset picture control options can be selected and each can be customised to your tastes. To adjust each preset you can either slide the quick adjust control in the menu left or right, to adjust how the preset looks without loosing the overall character of the preset, or you can dive into each individual option, such as saturation and contrast, and adjust it manually. Each preset applies different levels of colour saturation, contrast, sharpening and brightness depending on its suitability for the subject. For example the landscape picture control setting increases the contrast and colour saturation, whilst the neutral setting decreases both. Some examples of the different picture control settings can be seen below. 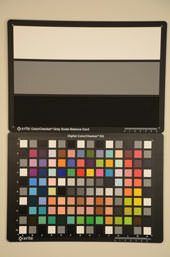 Nikon D7000 Colour reproduction: Click on the thumbnail for the larger image. Auto white-balance performs well under a range of artificial lighting conditions, often leaving a slight warm cast, which in many cases can be quite pleasant. In fact if performs so well under incandescent lighting that it is difficult at first glance to tell which image was taken on each setting. 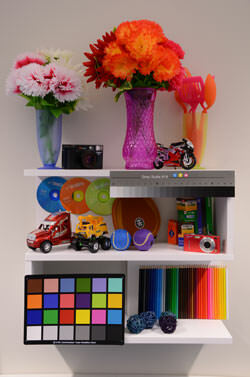 Under the warm white fluorescent lights in our studio, the auto white-balance setting performs well. Using the fluorescent preset resulted in a noticeable magenta cast. Each preset can be shifted towards blue or amber by turning the front control dial, allowing you to fine tune the results based on the conditions. Nikon D7000 White-balance test: Click on the thumbnails for larger images. In camera editing features have been steadily becoming more and more comprehensive on Nikon digital SLRs for quite a while now. They are a great way of achieve popular effects and for correcting common issues with images without a computer or the software and know how necessary to achieve the results you're after. The effects on offer are quite comprehensive and can be applied to JPEG images in camera, with the results being saved as a copy of the original image. If you shot your image in RAW, that can also be converted in camera, with adjustments to the exposure, white-balance and picture control setting all available amongst other common options. The quality of the effects is good and the interface for adjusting each one is simple and easy to follow, with the camera showing the final effect as you apply adjust the settings. Some of the effects many users will find incredibly useful, such as the ability to correct perspective, distortion and to straighten wonky horizons. Others are of more limited appeal such as the fish-eye lens effect and the miniature effect which aims to produce a similar result as is achievable with a tilt shift lens. Some examples of the results achieved with the in-camera editing options can be seen below. The D7000 is capable of recording full high definition 1080p video clips for up to 20 minutes at a frame rate of 24 frames per second. Footage recorded by the camera looks clean, crisp and free from artefacts and jerkiness. The built in microphone does a reasonable job of recording audio, although care will need to be taken if using autofocus during recording, as even AF-S lenses make enough noise to spoil the sound recorded. Luckily there is a microphone port for those who are more serious about recording video with the camera. This clip, recorded at 1920x1080 resolution at 24 frames per second shows how well the camera records motion. Even though the lighting conditions were less than ideal, there are no artefacts. Although the camera only has a buffer large enough to queue 17 large JPEG images before writing them to the card the Expeed 2 processor does an excellent job of processing them quickly. Using a class 10 Lexar SDHC card I managed to take 48 large JPEG images in 7.97 seconds before the camera slowed. That averages out at 6.02 frames per second, which is an indistinguishable amount faster than specified. 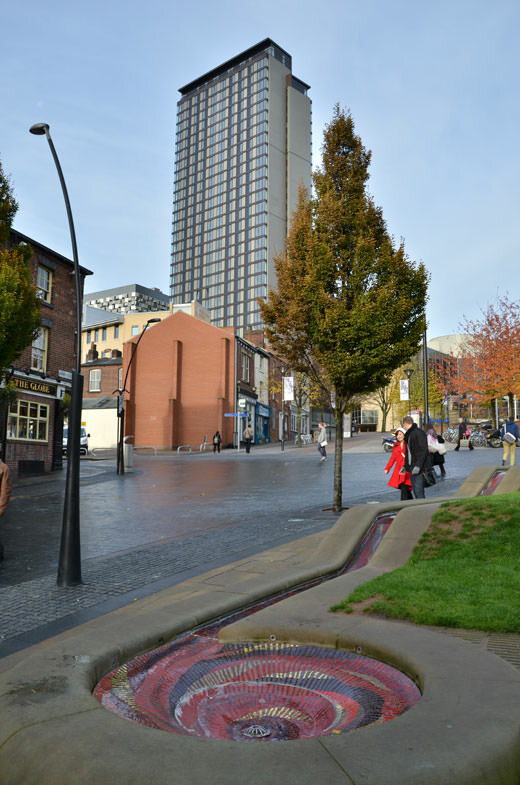 When shooting RAW images the buffer is a little shallow, only having space for 10 images. I did manage to shoot 13 images before the camera slowed, due to the high speed of the card. This may prove limiting for those who do shoot RAW at fast frame rates for recording sports or action. The new EN-EL15 battery pack seems to perform very well indeed. After taking 543 shots, many with live view, about 30 minutes of video and all the in camera editing you see in this review, plus more, the battery information screen still showed the battery holding 68% of its charge. This is impressive performance and should provide ample power for a typical day's shooting. The D7000 kit supplied for testing came with the basic AF-S 18-105mm f/3.5-5.6 VR lens, which seemed adequate for general picture taking during testing. It shows all the common hallmarks associated with high zoom range lenses such as barrel distortion at the wide end, and pincushioning at the telephoto end. Still the lens was capable of producing very good sharpness and we will be conducting a more in depth test of the lens separately. 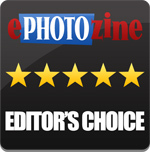 Please visit our latest lens reviews. Visit the DxOMark website for tests performed on the Nikon D7000. At first glance, the D7000 is difficult to pigeon hole in Nikon's current range of cameras. Although it is marketed as a consumer DSLR, it offers many features you'd expect to find on professional models, such as weather sealing, a fast continuous shooting rate and magnesium build. After using the camera for some time, I can see what Nikon are doing here. It is aimed squarely at those who may look towards the company's professional offerings, and maybe don't need the extra ruggedness, but do require a camera they can grow with whatever their level of photography. This model does this extremely well by offering a good balance automatic assistance and manual control without sacrificing features and customisability. Performance-wise, the D7000 is no slouch either. It feels extremely responsive and delivers great image quality, even at high ISO settings. Those upgrading from previous Nikon bodies such as the D80 or D90 and even down-graders from the D200 and D300 may be disappointed that the battery has changed, but the camera offers enough in other areas to still make this a compelling choice. The street price may seem a little high when compared to that of the D300s, but many may find this a better choice overall due to the lighter weight, automatic assistance on offer and even the in camera editing functions, which are amongst the most comprehensive I've seen. For me the D7000 fills a gap in Nikon's line-up that many photographers, especially many who frequent this site fall into. 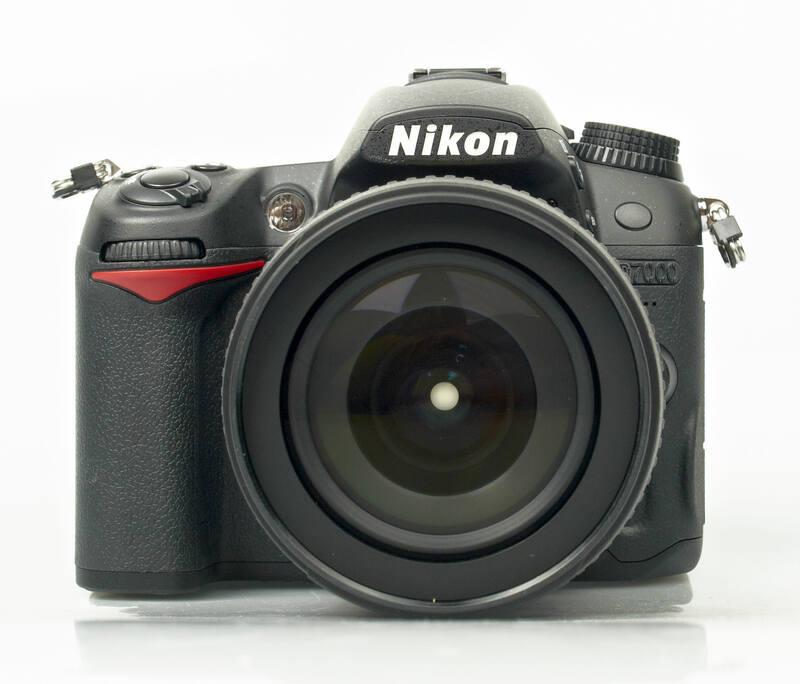 The Nikon D7000 raises the bar for features you'd expect from a consumer DSLR. Focus types Autofocus (AF): Single-servo AF (AF-S); continuous-servo AF (AF-C); auto AF-S/AF-C selection (AF-A); predictive focus tracking activated automatically according to subject status. Manual focus (M): Electronic rangefinder can be used. Metering types Matrix: 3D colour matrix metering II (type G and D lenses); colour matrix metering II (other CPU lenses); colour matrix metering available with non-CPU lenses if user provides lens data. Centre-weighted: Weight of 75% given to 8 mm circle in centre of frame; diameter of circle can be changed to 6, 10 or 13 mm, or weighting can be based on average of entire frame (fixed at 8-mm when non-CPU lens is used). Spot: Meters 3.5 mm circle (about 2.5 % of frame) centred on selected focus point (on centre focus point when non-CPU lens is used). White-balance Auto (2 types), Incandescent, Fluorescent (7 types), Direct Sunlight, Flash, Cloudy, Shade, preset manual (up to 5 values can be stored), choose color temperature (2,500 K to 10,000 K), all with fine tuning; white balance bracketing: 2 to 3 frames in steps of 1, 2 or 3.
on the back of this, i went to jessops last friday and had a good half an hour playing with both the D7000 and D300s, clearly there is no comparison in build quality with the D300s it would be simply misleading to say it was as well built. just put it in your hands and you can tell the difference. it is however very well built for a consumer body , and it handles like a dream. the u1/u2 setting presets are great and having the program modes on the top left dial as they were on older film cameras was really nice and better to use. i didnt like the metering modes being taken off a separate switch and put onto the top screen. i really liked the live view switch. i really didnt like having no sync socket for a cable type release, i cant be doing with remote infra reds that i can lose too easily. i prefer them dangling under the tripod head on a lead. i couldnt find a sync socket for plugging in flash heads and neither could the Jessops salesman. must be meant to use commander mode somehow. Jessops sales staff are about 20% as good as they used to be. it does have some nice features but i still came away with the d300s. or Rather i went to Warehouse express and saved over a hundred buying the D300s body £970 which has to be a better buy than £1099 for a D7000. Truth is i think the D7000 is overpriced. I agree with Ken Rockwell's summation of the Nikon D7000 " The D7000 is Nikon's most advanced camera at any price. The fact that it sells for $1,200 make it a no-brainer, which is why it's sold out. The D7000 is Nikon's best DSLR ever. " Here in New Zealand the D300s sells for more than the D7000. I have owned a D300 for the last 2 1/2 years and whilst it has served me well the D7000 is light years ahead, especially in picture quality. The D300s and the D300 are almost identical, i certainly wouldn't even consider the D300s. In nearly every area the D7000 outscores the D300 & the D300s. One area which for me is quite critical is shooting at high ISO's. The D300 was okay in this area but once you start shooting at anything over about 1600 ISO that noisy grain starts to get worse. In comparison the D7000 is miles ahead, i shot a photo at ISO 3200 and wow virtually no noise. Yes the body is smaller but i plan to add the battery grip, this changes the whole complexion of the camera. Very good review and i'm more than happy with my D7000.
" The D7000 is Nikon's most advanced camera at any price. The fact that it sells for $1,200 make it a no-brainer, which is why it's sold out. The D7000 is Nikon's best DSLR ever. " Here in New Zealand the D300s sells for more than the D7000. I have owned a D300 for the last 2 1/2 years and whilst it has served me well the D7000 is light years ahead, especially in picture quality. The D300s and the D300 are almost identical, i certainly wouldn't even consider the D300s. In nearly every area the D7000 outscores the D300 & the D300s. One area which for me is quite critical is shooting at high ISO's. The D300 was okay in this area but once you start shooting at anything over about 1600 ISO that noisy grain starts to get worse. In comparison the D7000 is miles ahead, i shot a photo at ISO 3200 and wow virtually no noise. Yes the body is smaller but i plan to add the battery grip, this changes the whole complexion of the camera. Very good review and i'm more than happy with my D7000. Just traded my Canon 40d and 50d for two D7000s to use at weddings. I am very happy with the performance of this gem of a camera. If you can put up with the price, then buy one. :D PS the review on this site is spot on. Just traded my Canon 40d and 50d for two D7000s to use at weddings. I am very happy with the performance of this gem of a camera. If you can put up with the price, then buy one. PS the review on this site is spot on. By far the best review on this camera. I already own a D90 and purchased the D7000 2 months ago, The D90 is an excellent camera while this one is unique. I agree a 100% with all of your comments, except for the price. I followed Ken Rockwell advised on this and a few lenses such as the 50mm f1.8, 35 mm f1.8, 70-300mm f4.5-5.6 vr, and an 18-55mm f3.5 and the 18-105mm vr. I am so thrilled with this purchase that i sent him through Paypal 10$us. I strongly recommend for users the book Nikon D7000 Digital Field Guide from Dennis Thomas isbn:978-0-470-64864-3, it even includes a free gray card and a color chart. Was very close to buying one of these and am grateful for such an excellent review, until I realised that it doesn't have headphone jack to monitor sound as you record. This is important to me as I conduct video interviews with before taking stills shots. At the moment I have to take 2 bits of kit and this would save on the weight problem. Is the sound 100% reliable? I still work as an audio producer and old habits die hard. I have had a D90 for the pass two years and recently bought me a D7000. Believe me when I say that the D7000 is not only a substantial upgrade over the D90 ergonomically wise but image quality is above the D90 . It feels much rugged and solid in the hands as the D300s and feels heavier . My D90 has battery grip with two batteries and the D7000 feels as weighty . The new autofocusing system is great , fast and accurate . Iso performance is a dream as having had to use my denoiser program on the D90 photos with the D7000 I can go all the way up to 3200 with worrying about artifacts or noise ( down side is that I can't play as much with my denoiser :( . The noise there is , is very different from the noise on the D90 . It seems like a very fine grain , and relates very well with the type of noise you can get with film which is less obvious and in some instances rather helps the photographic intent. You can change the autofocusing without having to go into the menu as the D90 . You can pick 12 bit or 14 bit processing , change compression ratios on JPG , in camera raw handling and jpg conversion from raw . Its jpg engine is very good as differences between jpg and raw are extremely slight . All in all the D7000 is an excellent alternative for those who have always wanted what the D90 lacks that you could only find in Nikons upper scaled D300s . I have had a D90 for the pass two years and recently bought me a D7000. Believe me when I say that the D7000 is not only a substantial upgrade over the D90 ergonomically wise but image quality is above the D90 . It feels much rugged and solid in the hands as the D300s and feels heavier . My D90 has battery grip with two batteries and the D7000 feels as weighty . The new autofocusing system is great , fast and accurate . Iso performance is a dream as having had to use my denoiser program on the D90 photos with the D7000 I can go all the way up to 3200 with worrying about artifacts or noise ( down side is that I can't play as much with my denoiser . The noise there is , is very different from the noise on the D90 . It seems like a very fine grain , and relates very well with the type of noise you can get with film which is less obvious and in some instances rather helps the photographic intent. You can change the autofocusing without having to go into the menu as the D90 . You can pick 12 bit or 14 bit processing , change compression ratios on JPG , in camera raw handling and jpg conversion from raw . 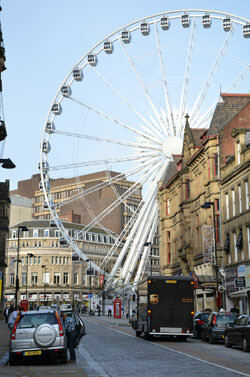 Its jpg engine is very good as differences between jpg and raw are extremely slight . All in all the D7000 is an excellent alternative for those who have always wanted what the D90 lacks that you could only find in Nikons upper scaled D300s . I am an intermediate user with a lot of film experience. I grew up on a fully manual Minolta (still love this camera) but I never purchased a DSLR. I made the jump to the D7000 and I am very happy. Learning to use the D7000 has improved my understanding of all of the extra features on my Canon Powershot S95 (another great camera.) Jumping to the bottom line, I love the features. I ultimately selected this model for the dual memory card slots. The programmable user settings give you what amounts to three different manual configurations. The VR lenses are very impressive (I am no longer a skeptic.) I got the camera about a week ago and already have my personal settings configured and one user setting programmed. This may not sound like a big deal but it is when you want to try out the differences and effect of some relatively minor adjustments. I agree with a lot of the other reviewers that the camera does seam to overexpose. I find myself going a little below the meter a lot and setting up the bracket for -1EV. I am still experimenting with the video but my first impression is that this camera will never replace my Sony HDR-SR11 but it is nice to be able to toggle back and forth. The auto-focus is clearly audible in playback. The focus tracking works but you will probably turn it off for sensitive recording. The pictures are great. I think before going up to 24mp I would look into better glass in front of the sensor.The camera is a little big for my 7 year old but she is still able to use it and make great photos. Exactly what I was looking for. buy this camera on [link=http://amzn.to/nikondslrd7000]HERE[/link] and save your money $100. Jumping to the bottom line, I love the features. I ultimately selected this model for the dual memory card slots. The programmable user settings give you what amounts to three different manual configurations. The VR lenses are very impressive (I am no longer a skeptic.) I got the camera about a week ago and already have my personal settings configured and one user setting programmed. This may not sound like a big deal but it is when you want to try out the differences and effect of some relatively minor adjustments. I agree with a lot of the other reviewers that the camera does seam to overexpose. I find myself going a little below the meter a lot and setting up the bracket for -1EV. I am still experimenting with the video but my first impression is that this camera will never replace my Sony HDR-SR11 but it is nice to be able to toggle back and forth. The auto-focus is clearly audible in playback. The focus tracking works but you will probably turn it off for sensitive recording. The pictures are great. I think before going up to 24mp I would look into better glass in front of the sensor.The camera is a little big for my 7 year old but she is still able to use it and make great photos. Exactly what I was looking for. buy this camera on HERE and save your money $100. Great review, as usual! This was one of the reviews that helped me decide on my purchase. I bought my Nikon D7000 about a year ago after having owned a Nikon D90. The D7000 is an excellent camera and, as far as I can tell, it could only benefit of a slightly larger MP count and better high ISO performance, hence the 4 stars only. But for its price tag, it is fantastic. I have some examples of my photos in my blog (http://mpimpao.com/index.html) and some more in 500px (http://500px.com/marcomacfool). If I could switch for a different camera it would only be for a full frame D800. Informative review Gary, just what we need.